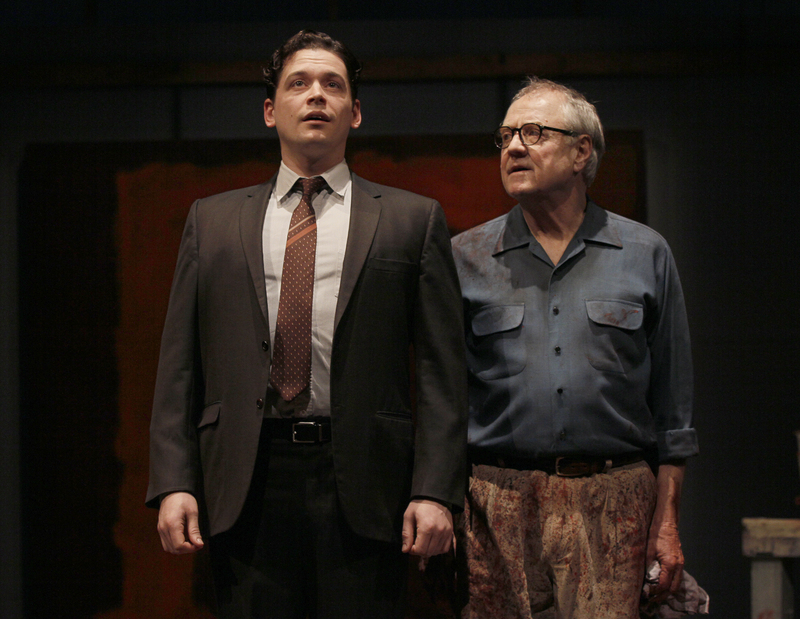 (l to r) Connor Toms and Denis Arndt star in the Tony Award winning play RED at Seattle Repertory Theatre. Even as the words begin to form in my head, I hear the commanding voice of Denis’ rendition of abstract painter, Mark Rothko bellowing at me, “What do you see?” I am left to question my own understanding, like Connor Toms portrayal of Rothko’s apprentice Ken. Am I human enough to get it? To feel it? I sit here and find myself reminiscing about an earlier time in my own life. A period when time itself seemed limitless and the thought of hanging out at the local IHOP drinking coffee with friends until 4am, wrestling with deep philosophical quandaries, seemed the most important of activities to attend to. I have to wonder; am I just starved for deep and meaningful conversation or is John Logan’s writing compelling enough to instill in me a renewed hunger for those college days and to engage in meaningful dialogue with others? Art. There is my quandary. I am inadequate to speak to your experience of the performance; I am limited to sharing only my perception of it and how it made me…feel. As awkward as it is to even have to write that last sentence, it is a powerful indicator of the effect that Red can have on audiences. I may very well be an isolated example, but I don’t think so. Let me wade into the deeper waters and share what watching Red incited within me. I am struck by the relationship between Ken and Rothko, which Arndt and Toms bring vividly to life. Ken, a young artist, sees the caustic old Master painter Rothko as a possible source of affirmation of his craft, but also to fill the needed role of mentor, teacher and even father-figure in his life. This flies in the face of every word spoken by Rothko, who reminds Ken repeatedly to abandon any such thoughts and accept that he is only an employer. When a comment rubs him wrong, Rothko quickly lapses into the most revealing (and entertaining) fits of acerbic and vitriolic tirades, which flow like waterfalls of Tourette-laced poetry from Arndt’s mouth. Red does not play it safe. It does things that I have never seen before on stage, which shocked and delighted me. We forget that most of what we see on stage are illusions which the performers have succeeded in getting us to buy into. When they mix paint on stage, you assume that it’s an act. There is no liquid, no color. Not with Red. 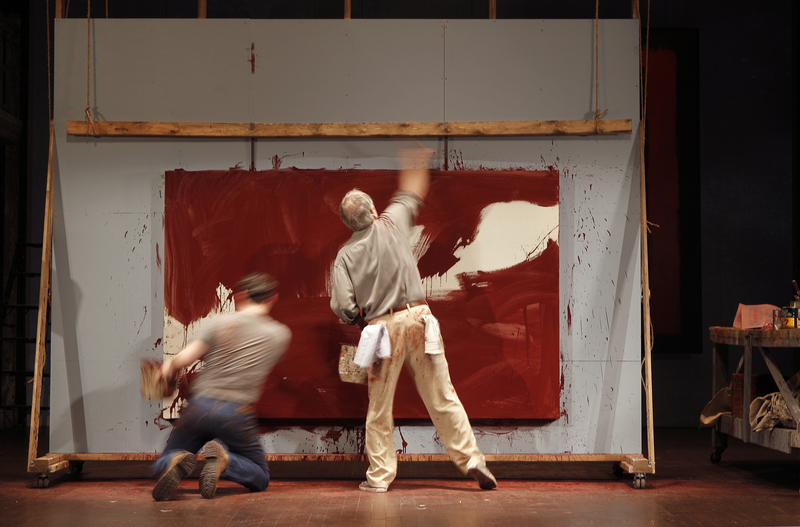 Audible gasp were uttered across the audience when Arndt dips his brush into the bucket and pulls out a wet brush which drips maroon paint across the stage. Our horror is magnified when in a fit of rage; he throws the wet brush to the ground, scattering paint across the floor. Beautiful. Reality has rudely crashed our make-believe party. 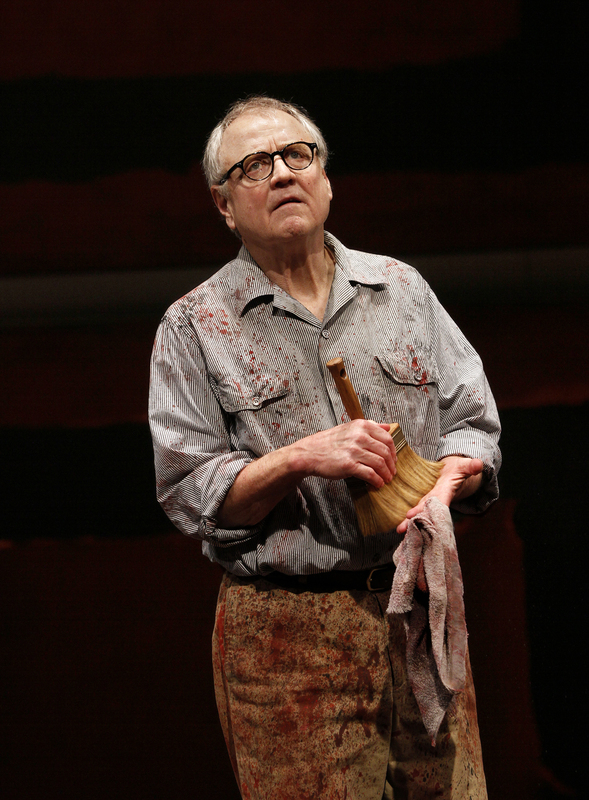 Denis Arndt in the Tony Award winning play RED at Seattle Repertory Theatre. As Rothko and Ken extrapolate back and forth over the concept of what Art is; you begin to realize that while a definition may be difficult to pin down, one thing is sure. It’s deeply personal for each of them. This verbal tango goes back and forth building tension throughout the play; like foreplay to the audience. By the time a large canvas is hung and they execute a symphonic coordinated flurry of brush strokes, laying down the base color, the audience is ecstatic, even euphoric. You feel the rush of watching something profoundly intimate, like birth; the creation of new life. Rothko says that movement is life and that unlike ‘still lifes’ his paintings live, breathe and pulse. With the painting hung to dry, we are left exhausted, with only the afterbirth of splattered paint scattered across the floor, stains upon their hands and arms, shirts and pants to remind us of what took place there. Giving birth to new life is messy and painful. Both the Master and the apprentice bear the scars of life’s pain, which they hold within themselves and try to train, to channel; it becomes their muse, the source of their creative expression. Throughout the play, we see the transformation of the Master’s descent and the apprentice’s ascent. Death awaits the Master, the black threatening to blot out the red, but death lies behind the apprentice. It’s the rite of passage, a boy entering into manhood. Prophetic words were uttered from the Master’s lips and tell us what must come to pass, “the child must banish the father”. Ken must become a fully realized human being and become his own man; in that transformation he discovers his own voice. Rothko recognizes this and accepts it, though he must sacrafice fellowship for it to be fully realized. While Art can be subjective, there is no denying the quality of the writing and the depth of the characters developed by Denis Arndt and Conner Toms. With shocking and emotive stage direction, Red holds the audience captive, granting them a rare view into the creative process, the demons which artists wrestle with, the pain which they try to channel and the danger they live with of losing faith in their audience. There is a symbiotic connection forged between the artist and the audience. Should that relationship be severed, the artist can become disconnected from life and slowly despair begins to fill the void. In a strange way, Rothko’s tirades against art devoid of meaning and life yet embraced by the next generation, belies his own desperate need to have his work vindicated by others, who can understand the powerful message of his paintings. Without that, he knows all too well, that the well-worn path lies down the same route which Pollack took when he lost faith in people to understand his paintings. Don’t miss out on Red! It’s an evening immersed in life, relationship and meaning. If you allow it to, it will draw you out of your self-induced slummer; our sleep walking modern existence and for a moment perhaps awaken us to the possibility of being fully alive. Due to popular demand, Red has already been extended another week and runs from Feb. 24-March 24, 2012. Seattle Repertory Theatre is located at Seattle Center at the corner of Second Ave. and Mercer St., Seattle, Washington. For show time’s go to www.seattlerep.org. Nietzsche, et al, takes me back to Doc Hansen’s classroom and the days when I was capable of staying up until 4am to discuss such heady thoughts. Tomorrow evening I’ll head over to the local high school and dive into a series of one-act plays that are student written and student directed. I might need to read up on some Nietzsche before going!